Bay. The group was protesting new construction in the park. Twenty-two protesters wearing black armbands formed a circle along Kalanianaole Highway yesterday as a chanter's voice asked the gods to make what is wrong right. The group was expressing sorrow for what it calls the desecration and destruction of Hanauma Bay. Excavation for the bay's marine education center was to begin today. "We feel it's just another tragedy, another case of disrespect for the aina," said Nuuanu resident Leroy Akamine, who held a sign that read, "Pilikia Nui," meaning big trouble. "It's the work of politicians who have no sense of the meaning of aloha aina," he said. Akamine said he would often go to Hanauma Bay over 50 years ago as a child. He would like to see it preserved for future generations. 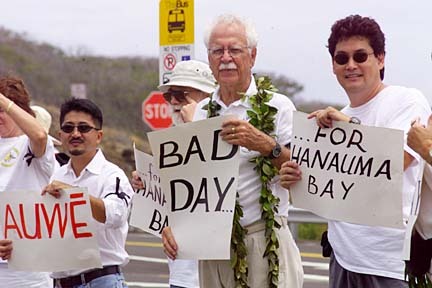 But Roy Benham, a member of the East Honolulu Community Coalition, realized the futility of the protests. "It's a done deal, unless they find iwi (bones)," Benham said. Moiliili resident John Zuern and his wife, Laura Lyons, who only come to the bay when they have visitors, say they sympathize with the protesters. "It's a real dilemma for people trying to educate the public," Zuern said. "You don't want the education to detract from the beauty of the environment." The couple brought Michelle Derby of Cheyenne, Wyo. to enjoy the bay, her second trip in six years. Derby believes the visitor center ought to be mandatory, so visitors will understand the reef is a living thing. "It really is depleted," she said. For opponents, one sore point is the location of a gift shop on the edge of the bay, and the education center 45 feet from the rim. "They're putting that atrocious building right on the edge of this beautiful bay where people should be looking at the bay," said Marion Kelly, 81, spokeswoman for Save Our Surf. She said that if the center has to be built, why not build it farther back from the edge of the bay? Alan Hong, Hanauma Bay's manager, said the P-shape building, 22 to 24 feet high and 165 feet long, will be built in a depression with a grassy mound to further obscure the building. Peter Rappa, the bay's educational director, said, "From the highway you'll be able to see the bay as you see it now." Rappa, however, said the goal of the education center would be for all visitors to view an orientation video explaining marine conservation and safety. He said it would be difficult to corral visitors into the center if it were located on the opposite side of the parking lot or elsewhere. With the center located at the entrance, all visitors would be obliged to walk through it. Right now, Rappa said, he and his staff reach 10 percent to 15 percent of all park visitors. He said it is hard for him and his staff to try to educate people as they are heading for the beach because they are viewed as impediments to getting to the beach. Kelly Washino, the communications chairwoman of the East Honolulu Community Coalition, said the group has been frustrated by the mayor's refusal to discuss alternate site recommendations for the center. Cynthia Bond, a city facilitator for the coalition, said a task force recommended the site for the 497-square-foot gift shop and the center. Benham said, "Because we were deeply disappointed, we have to heal ourselves." He said his group's next step will be to request a kukakuka, a talk with the mayor to start the healing process.